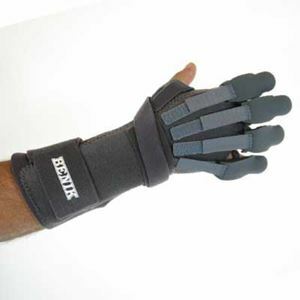 The W-710 forearm splint provides forearm and wrist support associated with digit. 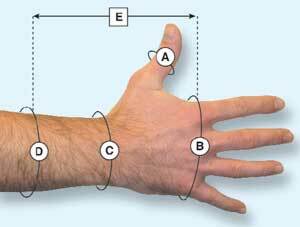 hand and writ weakness or paralysis secondary to CVA/TBI. It also provides digit and thumb MP extension and digit PIP/DIP extension. Also helps in decreasong minor spasticity and flexor tone. The custom splint is designed dynamically with a low profile design that is functional and pleasant. It positions the hand open and makes it ready for use for daily activities. The weight of the splint is 5.5 ounces. Comes as left and right. S/M 6 1⁄2" - 8" 6" - 11 1⁄2"
M/L 8 - 9 1⁄2" 6" - 12 1⁄2"
For custom fitting, take measurements as indicated (Measurements to the nearest 1/8" are most helpful). When ordering, note these exact measurements. A. Circumference at thumb IP. D. Circumference at proximal end. E. Desired length from index MCP to proximal end. When ordering, please ask for Order Form as this is a custom brace.